The off-road Mini Crossover Concept may be small on the outside, but on the inside there's a giant 3D globe that utilizes laser technology to integrate all of the car's entertainment, communication and navigational features into a touchscreen interface. The globe splits into hemispheres allowing the driver to check out a map while a passengers surfs the web. Intense laser projection displays information, in both text and graphic form, at multiple layers within the globe. The driver can either interface with the system by touching the globe or by using the trackball on the steering wheel — which also acts as the "key." Passengers can use the pop-out keyboard or slide controls below the globe. While this is still very much a concept, all the technology for it exists and we wouldn't be surprised to see Mini incorporate many of these features on a feature vehicle. Full description in the press release below the jump. The MINI Center Globe - a new vision of the central instrument of the future. Featuring their round Central Display right in the middle of the dashboard, the current MINIs already boast an interior design feature quite unique and unmistakable in its look. Indeed, this multi-function display serves to conveniently control all major entertainment, telecommunication and navigation functions, providing the speedometer function around its outer circumference. Now the MINI Crossover Concept introduces the consistent enhancement of this display and control concept: the MINI Center Globe. 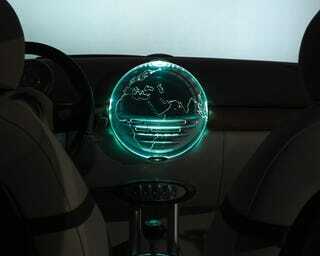 For the first time, therefore, the central display and control unit is designed in this Concept Study as a globe. This three-dimensional layout allows even more consistent integration of functions and the appropriate presentation of information and entertainment options. In addition to the vertical and horizontal display features currently available, the new instrument adds a further, three-dimensional element with displays stratified on various levels and highlighted to a greater or lesser degree, depending on the driver's and front passenger's requirements. The current speed of the car, finally, is shown as before in typical MINI style on the display round the edge. To clearly, flexibly and legibly present all information at all times, the MINI Center Globe comes with ultra-modern laser projection technology. With its unique optical features, the laser projector allows simultaneous presentation of pictures on various levels, with a varying focus and in powerful colours. Benefiting from this technology never seen before in an automobile worldwide, the MINI Crossover Concept is also able to optically separate the MINI Centre Globe into two hemispheres. These adjustable, moving hemispheres then enable the driver and front passenger to present and view different pictures recognisable only from their individual perspective. In other words, the front passenger may for example surf the net while the driver maintains his free view of all displays and instruments. To provide this special effect, the hemisphere facing the front passenger closes down from the other side and acts as a projection surface presenting the pictures required. The MINI Centere Globe presented in this Design Study already shows today what options are conceivable in terms of navigation, communication and entertainment in the car of the future, using innovative technologies of this outstanding calibre. The driver and/or front passenger operate the MINI Centre Globe by a touch-sensitive surface, a trackball on the steering wheel, buttons and slide controls in the lower section of the MINI Centre Globe, and a keyboard on the front passenger's side extending at the touch of a button from the dashboard. Such versatile and flexible use of the MINI Center Globe gives this new control unit the character of an innovative travel companion adjusting at all times to the individual wishes of the driver and front passenger and helping them enjoy mobility in a new dimension wherever they go. The MINI Centre Globe is additionally linked to the starter system for the engine. Instead of a conventional key, the driver uses a start/stop unit referred to as the Keyball. To start the car, all the driver has to do is insert the Keyball on the MINI Crossover into the appropriate opening in the upper edge of the MINI Centre Globe. The Keyball then rolling towards the driver along the middle of the MINI Centre Globe. In this position the driver is able to press the Keyball in order to start the engine. Pressing the Keyball again, in turn, he switches off the engine and the Keyball rolls down into its housing bay from where the driver can conveniently remove the ball.